Take a break from the city and head to Scuba & Snorkeling and Palm Cove Beach. We've included these beaches for you: Trinity Beach and Ellis Beach. Get out of town with these interesting Cairns side-trips: Palm Cove (Village Gallery & Spas). Spend the 21st (Fri) wandering through the wild on a nature and wildlife tour. Next up on the itinerary: stroll through Esplanade Boardwalk, view the masterpieces at Underart Gallery, relax and float downstream with a rafting and tubing tour, and admire the masterpieces at Samurai Gallery Australia. For where to stay, maps, reviews, and more tourist information, read our Cairns online day trip planner . Manchester, UK to Cairns is an approximately 23-hour flight. The time zone difference when traveling from Manchester to Cairns is 10 hours. In June, Cairns is somewhat warmer than Manchester - with highs of 30°C and lows of 22°C. Wrap up your sightseeing on the 27th (Thu) to allow time to travel to Airlie Beach. Your cultural itinerary includes sights like Above & Below Photography Gallery and Art Whitsunday Gallery & Shop. Get outdoors at Scuba & Snorkeling and Airlie Beach Lagoon. Change things up with these side-trips from Airlie Beach: Bowen (Horseshoe Bay Rotary Lookout, Grays Bay, & more). On the 29th (Sat), spend a thrilling day on the water with a speed boat tour. Spend the 2nd (Tue) wandering through the wild on a nature and wildlife tour. And it doesn't end there: get interesting insight from Tours, take the plunge with a skydiving experience, indulge in some personalized pampering at some of the best spas, and see the interesting displays at Proserpine Museum. To see where to stay, photos, traveler tips, and more tourist information, refer to the Airlie Beach road trip site . Traveling by combination of flight and ferry from Cairns to Airlie Beach takes 5 hours. Alternatively, you can do a combination of flight and bus; or drive. Traveling from Cairns in June, you will find days in Airlie Beach are slightly colder (26°C), and nights are about the same (21°C). Wrap up your sightseeing on the 3rd (Wed) early enough to take a bus to Townsville. National Trust Heritage Centre and Kissing Point Fort will appeal to history buffs. Museum of Tropical Queensland and Umbrella Studio Contemporary Arts are good opportunities to explore the local culture. Spend the 4th (Thu) among aquatic life with a scuba or snorkeling tour. Spend the 8th (Mon) exploring nature at Bowling Green Bay National Park. There's much more to do: kick back and relax at The Strand, get some thrills out on the water with a waterskiing or jet-skiing adventure, take a peaceful walk through Gondwana Rainforest, and identify plant and animal life at Wet Tropics World Heritage Area. To find photos, reviews, where to stay, and tourist information, go to the Townsville trip planner . Traveling by bus from Airlie Beach to Townsville takes 4 hours. Alternatively, you can drive; or do a combination of bus and train. Traveling from Airlie Beach in July, expect nights in Townsville to be little chillier, around 17°C, while days are somewhat warmer, around 29°C. Wrap up your sightseeing on the 10th (Wed) early enough to travel to Longreach. Longreach is a town in Central West Queensland, Australia approximately 700km from the coast, west of Rockhampton. Start off your visit on the 11th (Thu): see the interesting displays at QANTAS Founders Museum, then see the interesting displays at Australian Stockman's Hall of Fame and Outback Heritage Centre, and then contemplate the long history of Longreach. To find other places to visit, maps, more things to do, and more tourist information, read our Longreach road trip website . Traveling by combination of flight and bus from Townsville to Longreach takes 6 hours. Alternatively, you can fly; or drive. Traveling from Townsville in July, you can expect nighttime temperatures to be little chillier in Longreach, with lows of 10°C. Wrap up your sightseeing on the 11th (Thu) to allow time to travel to Brisbane. Visit Surfers Paradise Beach and Burleigh Heads Beach for some beach relaxation. Get some historical perspective at Wynnum Esplanade and Nepalese Pagoda. Explore Brisbane's surroundings by going to Caboolture (Caboolture Warplane Museum & Abbey Church), Saint Augustine's Catholic Church (in Coolangatta) and Pelican Feeding (in Labrador). Spend the 16th (Tue) among aquatic life with a scuba or snorkeling tour. There's much more to do: look for all kinds of wild species at Lone Pine Koala Sanctuary, see the interesting displays at Queensland Museum & Sciencentre, tour the pleasant surroundings at Burleigh Head National Park, and have fun at South Bank Parklands. 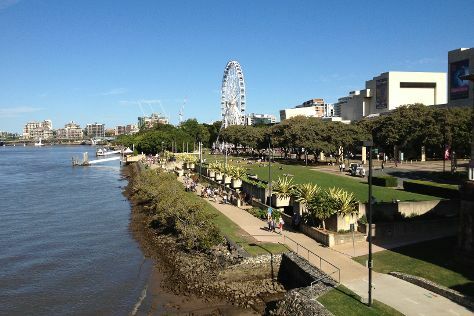 To see more things to do, where to stay, maps, and tourist information, use the Brisbane trip planner . You can fly from Longreach to Brisbane in 4 hours. Alternatively, you can drive; or take a bus. While traveling from Longreach, expect little chillier days and about the same nights in Brisbane, ranging from highs of 24°C to lows of 11°C. Finish your sightseeing early on the 19th (Fri) to allow enough time to drive to Noosa. You'll get in some beach time at Noosa Main Beach and Marcoola Beach. 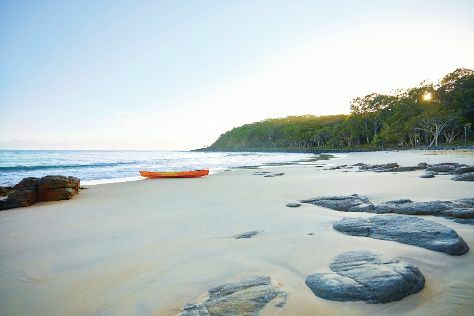 Take a break from the city and head to Noosa National Park and Kings Beach. Explore the numerous day-trip ideas around Noosa: Maroochydore Beach (in Maroochydore), Chenrezig Institute (in Eudlo) and Buderim (Atrium Gallery at Buderim Craft Cottage & Pioneer Cottage Buderim). There's still lots to do: kick back and relax at Mooloolaba Beach, take a stroll through Hastings Street, see the interesting displays at Mapleton Observatory, and enjoy the sea views from Caloundra Lighthouses. For ratings, other places to visit, more things to do, and other tourist information, refer to the Noosa trip itinerary maker app . Drive from Brisbane to Noosa in 2 hours. Alternatively, you can take a train; or take a bus. Cap off your sightseeing on the 26th (Fri) early enough to travel to Fraser Island. You'll get in some beach time at Seventy-Five Mile Beach and Indian Head. Get outdoors at Sandy Cape Lighthouse and Central Station Rainforest. For reviews, photos, maps, and other tourist information, use the Fraser Island trip builder tool . Traveling by combination of car and ferry from Noosa to Fraser Island takes 7 hours. Alternatively, you can do a combination of train, ferry, and car; or do a combination of bus, ferry, and car. In July, daytime highs in Fraser Island are 26°C, while nighttime lows are 11°C. Finish up your sightseeing early on the 31st (Wed) so you can travel to Atherton. Atherton is a town and locality on the Atherton Tablelands within the Tablelands Region, Far North Queensland, Australia. Get a sense of the local culture at Historic Village Herberton and The Crystal Caves. Escape the urban bustle at The Bat Hospital Visitor Centre and Curtain Fig National Park. Change things up with these side-trips from Atherton: Herberton (Spy & Camera Museum & Herberton Mining Museum). The adventure continues: look for all kinds of wild species at Atherton Tableland, view the masterpieces at Artistree Gallery, and browse the exhibits of Tolga Woodworks Gallery & Cafe. For more things to do, traveler tips, reviews, and more tourist information, you can read our Atherton online trip itinerary planner . Explore your travel options from Fraser Island to Atherton with the Route module. In August, Atherton is somewhat warmer than Fraser Island - with highs of 31°C and lows of 19°C. Wrap up your sightseeing on the 3rd (Sat) early enough to travel to Cape Tribulation. A lush headland that's part of the forested Daintree Region, Cape Tribulation was so named by Lieutenant--later Captain--Cook in 1770, when his ship ran aground in the area. You'll get in some beach time at Thornton Beach and Myall Beach. Visiting Daintree Discovery Centre and Cape Tribulation Beach will get you outdoors. Venture out of the city with trips to Daintree (Daintree Tea & Photography Tours), Bloomfield Waterfall (in Bloomfield) and Grassy Hill (in Cooktown). Spend the 6th (Tue) exploring nature at Daintree National Park. 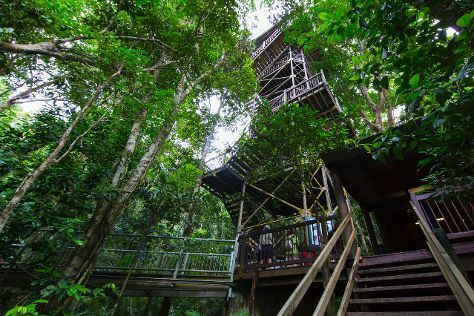 Next up on the itinerary: look for all kinds of wild species at Daintree Rainforest - Cooper Creek Wilderness, get a new perspective on nature at Daintree Entomological museum, hike along Dubuji Boardwalk, and admire the sheer force of Alexandra Bay Waterfall. To find ratings, more things to do, other places to visit, and more tourist information, refer to the Cape Tribulation online road trip planner . You can drive from Atherton to Cape Tribulation in 3.5 hours. Expect a daytime high around 31°C in August, and nighttime lows around 19°C. Wrap up your sightseeing on the 8th (Thu) early enough to travel to Port Douglas. Satisfy your inner culture vulture at Shannonvale Tropical Fruit Winery and Port Douglas Court House Museum. Visit Four Mile Beach and Wonga Beach for some beach relaxation. Spend the 11th (Sun) spotting exotic species with a safari tour. Spend the 9th (Fri) among aquatic life with a scuba or snorkeling tour. There's still lots to do: identify plant and animal life at Hartley's Crocodile Adventures, take in the exciting artwork at Des Spencer Galleries, explore the striking landscape of Mowbray National Park, and browse the exhibits of Studio 49 Artisan Gallery. Plan my trip to Port Douglas with suggested itineraries provided by Inspirock. Traveling by combination of car and ferry from Cape Tribulation to Port Douglas takes 2 hours. Alternatively, you can take a bus. August in Port Douglas sees daily highs of 31°C and lows of 19°C at night. Cap off your sightseeing on the 15th (Thu) early enough to travel back home.